I have been on quite the yarn kick lately. I have been loving both crocheting and knitting again, and especially hats. After our pumpkin beanie and then the Turkey leg Thanksgiving hat I had to come up with something for winter! I actually finished this just a few days AFTER Christmas, bummer, but I did make the hat bigger so MAYBE he’ll fit it next year (or my sisters new baby will?!?!). I’m thinking about adding big round eyes and a big red nose if it fits anyone next Christmas. But for now it’s a cute winter hat, esp since he spends most of his time in the Moby wrap and his head is the only thing people ever really see! And could be be any cuter? I can’t BELIEVE he’s 3 months old already, the time goes WAY to fast for my liking. I prefer to use the long tail cast on for hats, it leaves a clean and flexible edge. now to start decreasing for the crowns, the k2tog then ssk creates nice even lines up to the crown instead of having your decreases curve around your beanie. It’s a bit trickier, but totally worth it in the end in my opinion. cut the yarn with several inches left. With a needle pull the yarn through all the remaining loops, secure and weave in end. And the beanie is done! A great base for any baby hat! For the antlers you have two choices, using double pointed needles you can make them separately and attach them later or, like me, knit them directly onto the hat! Pick where you want your antlers (mine centered on each side, 4 rows down from the center- in hindsight I WISH I’d done my antlers more forward from the center) and slide 4 needles through 3 stitches on each side creating a square. We want to start with 12 stitches. Stuff it as you go. cut the yarn with several inches left. With a needle pull the yarn through all the remaining loops, secure and weave in end (remember the stuffing). going back to the skipped 7, add the cast on 2 stitches for a total of 9 and spread out evenly over 3 double pointed needles. cut the yarn with several inches left. With a needle pull the yarn through all the remaining loops, secure and weave in end (don’t forget to stuff). I had some wide holes where I knit the first row, so when I was done I took some extra yarn and sewed it a bit, tightening up the gaps, you can’t even see the gaps anymore! And it’s done!!! I love it! I’m sure there are better ways to create this, and I’m still a newbie, but I’m so tickled it turned out so well! And here you can see what I was talking about earlier on the crown of the beanie. The k2tog, ssk creates these beautiful and straight ribbed lines instead of a curved line from using just k2tog each round. It’s personal preference, but this totally fits my style! And one last picture, I can’t help it. I just love this sweet little boy so so SO much! He’s getting to be so big and so fun. He laughs now, and his smile melts every part of my being. He’s found his thumb, and finds it often, but I can’t seem to get a picture of it yet! He’s still an amazing baby, so happy all the time, rarely upset, very easy going and he makes all our lives better! I’m so glad he’s a part of our family! Such a cute baby! The knit cap is adorable, but even more cute on the baby lol. Ahhh thanks! I agree, the hat is cute but the baby is the real treat! Oh my gosh! That is so cute. And you make it look easy. I’m not a very ambitious knitter (I usually stick with things that are rectangular) but I think I can handle this. 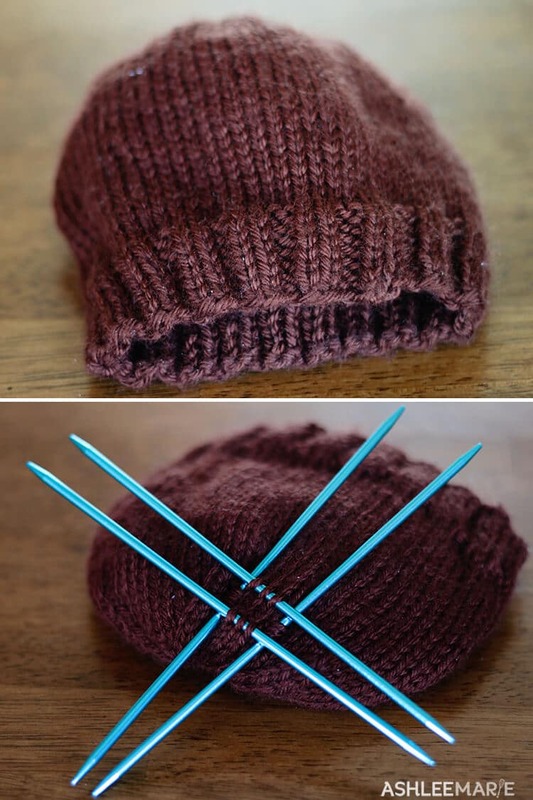 Other than how SMALL the antlers are if you can work double pointed needles you’ll do great! Good luck! It’s SO worth it. I tried years ago but couldn’t get the hang of it. I tried again last year and finally got it!!! I have loved it, there is something about knit that is just so pretty! He is absolutely precious! I remember when my little guy was that little…he’s now going on 20 months…The time goes too fast, that’s for sure! I love your hat design, too! It’s adorable! Nice job! Definitely one for the Ravelry favorites! It goes by TOOO fast, I am in shock that mine is already 3 months old. I’m glad you like my hat! Thanks so much! SO much fun, I crocheted for 8 years before I attempted to knit. I love it now (both actually) and so glad I took the plunge! That you do! It is a bit scary and daunting at first but SO worth it in the end! I am loving it! Thanks! I like them both too (of course the baby a tad bit more than the hat ;)! Ashlee, You are the queen! That is the cutest hat ever. You should sell it on etsy even though you just published it for free on your blog. A lot of etsy people would never know that!!!! Baby is adorable!!!! HA! That’s why I started a store in the first place, hearing “you could sell those”! It’s for sure not as easy as it sounds and in the end I hate making things more than once or twice! But If someone wants to take the pattern and sell hats I’m all for it (just not selling the pattern- since I’m all about giving it away for free it seems!) I am considering opening back up my shop for patterns, but then every time I write one I’m so excited to share it I can’t help myself. If I ever got into super complicated patterns, like full sweaters or something like that I’d be more apt to sell it rather than give it away! GAH! I’m so far behind responding to my comments, I’m afraid I missed your party! The beanie itself is pretty fast to throw together, the antlers did take some playing around with, but I bet it wouldn’t take you THAT long in the end! I hope you do try it, it’s so much fun, he’s still wearing it out and about! WOW! This is amazing and absolutely adorable. You are very talented! Knitting is not a craft I have tried my hand at, but you make it look tempting. As somedaycrafts said, you should sell this on Etsy! Even though you posted the directions, I could never make this (nor could a lot of people) and would definitely buy something like this if I was in the market for a baby hat. Stopping by from Whipperberry link party. Cheers! Thanks so much! That’s is so kind to hear. I used to have a store for just that reason, but in the end it’s just not for me, I kind of hate making something more than once or twice! Not good for a store! Thanks for stoping by! I hope you find a knitting friend you can make one for you! Stop it!!! That is too stinking adorable I can hardly handle it! If I had a little boy I would be teaching myself how to knit so I could make this ASAP 🙂 Love it! Thanks! My sweet little niece wants her own and if I end up making her one I’m going to add a pink bow to one of the antlers! oh. my. goodness. That is literally THE cutest thing I’ve seen all day. Love love love! Makes me wish I could knit! Would you make my day by sharing it here? Thanks so much!!! I’m so far behind in responding to comments I’m afraid I missed your party, I’m so sorry! This is great! I am hoping to learn to knit soon and I’ll definitely be back to try this out. Visiting from Flamingo Toes. Thanks for coming by! I learned to knit just 2 years ago and I’m so glad I finally did! It’s been so worth it, I still love to crochet, but there is something about knit for certain projects that just take the cake! Oh my gosh! This is so stinkin cute! That baby is so stinkin cute too! Thanks! We agree over here! He’s got to be the happiest baby ever!!! That’s wonderful! I hope you both like how it turns out! I love the hat and will have to make one or more. Thanks!!!! I love it too! I made it big enough that I HOPE Baby boy can wear it next year too, but I’m thinking of adding a red nose for next Christmas!!! Absolutely adorable! I just love it! Love it! I have a question about the antlers. You wrote; “going back to the skipped 7, add the cast on 2 stitches for a total of 9 and spread out evenly over 3 double pointed needles.” could you explain this a bit more? For some reason I cannot visualize it. So I have 7 stitches on a needle. Then do I cast on two more stitches at the end of that needle? Where does the cast on 2 come in? Thanks for your help! Cannot wait to make it! in row 15 you cast on 2 and then skipped 7, leaving them on another needle. Now your going back to those 7, but if you just knit those 7 you’d have a huge gap, you need to take those 2 you cast on in row 15 and pick them up with a needle, DON’T cast 2 more on. does that help? This is so adorable, I’m definately going to tackle this project right away! Is there an adult version for this pattern? I was thinking about making the whole family reindeer hats for Christmas. 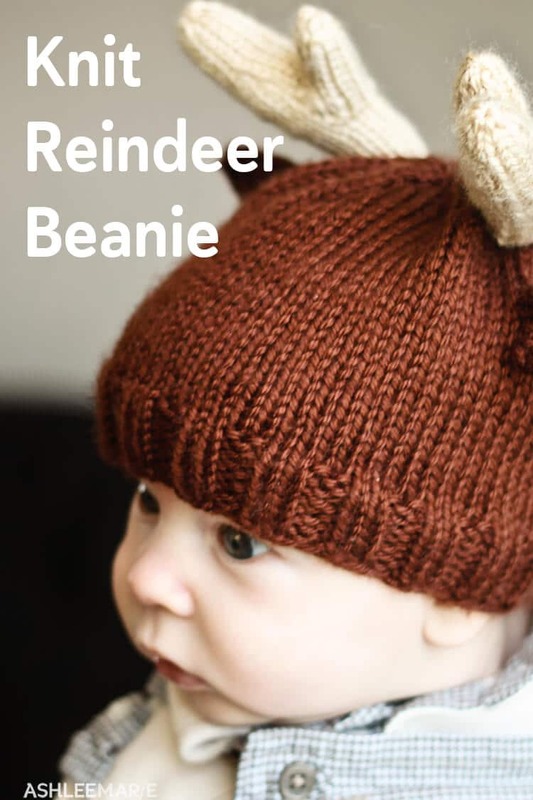 there isn’t, but if you make an adult beanie you can simply add the same ears and antlers to it! Very cute hat and great pattern. Thank you for sharing. I did however want to point out an error that I discovered while making this hat In row 10 of making the ears you wrote k2, p4, k2. However, I think you meant to write P2, K4, P2 as you are essentially working in a STST pattern in the center and written the original way creates an inconsistency in the piece. you are SO right! Thank you so much, I fixed it! Thanks for taking the time to let me know! Thank you for this adorable pattern!! I do have a question – I’m confused on the antlers where we’re skipping 7, on Row 15. When I get to that part, it’s the last needle – I have 9 stitches on there. I had to knit 1 to complete the previous instruction of knitting 12, then I cast 2 on using cable cast on. 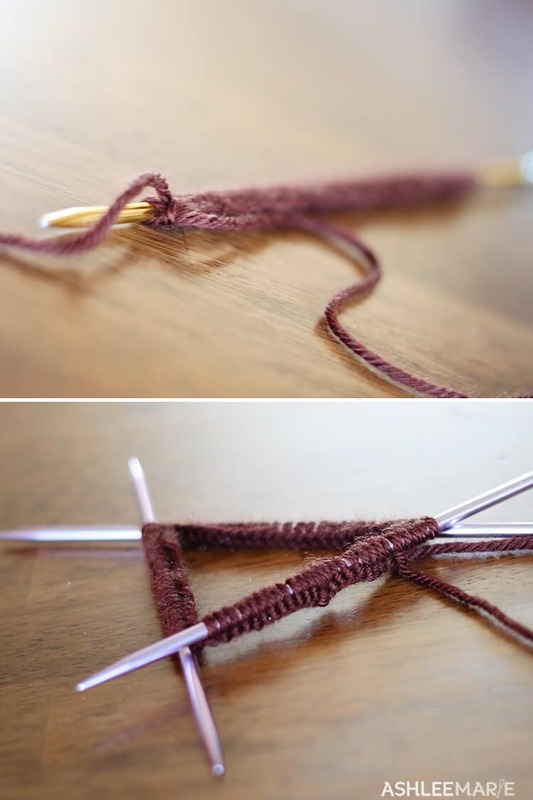 If I skip 7, I will not have a free needle, and I will also have a piece of yarn draping behind the skipped 7, and that leaves 1 stitch still on the needle that I can’t knit unless I move it to the first needle. Did I do something wrong? Should I cast the 2 on at the end of the 7? I’m really confused on how to skip these 7! It reminds me of the technique I used when making baby socks, but it’s been so long since I did that that I can’t quite remember how I left stitches behind on needles.. I saw that you figured it out, but wanted to make a note for anyone else you might be struggling. My double pouinted needles in this size cake with FIVE needles, so I have those 7 on the 5th needle while still working with the other 4. or you could use a needle a size down or, like you ended up doing, waste yarn. Actually, I figured it out.. I put the 7 stitches on waste yarn. Simple enough! This pattern is brillant. I am currently knitting this hat in the toddler size. It does seem big, it might even fit me, but I will have too see when it is finished. I’m sure it will work out great. Thank you for sharing this pattern with e world. By the way your babe is beautiful. From Lily from Northern Ireland. I’m so sorry, I wonder are you using a different weight yarn? 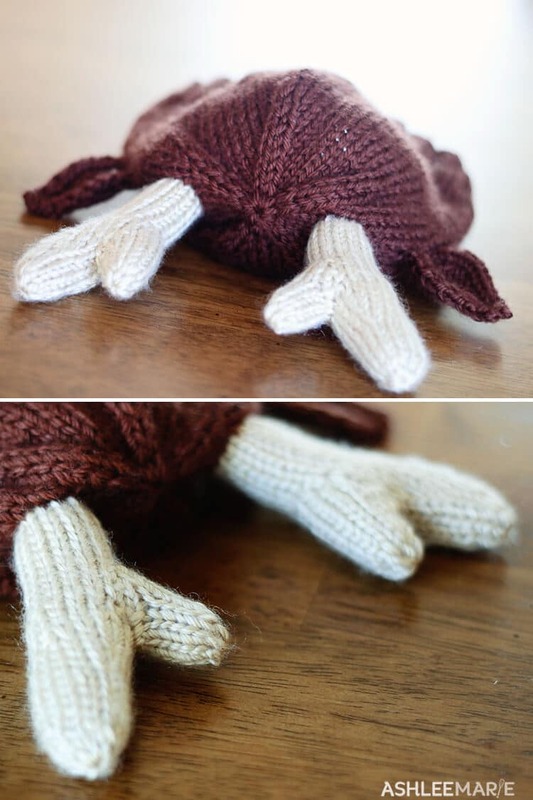 I always end up adjusting patterns I read a bit cause I either knit/crochet too tight or too loose, feel free to adjust it to what ever size you need.. and thank you, he’s a pretty precious little guy! Thanks for sharing your pattern! I added felt eyes & a red pom Pom to make it Rudolph. So cute! Adorable! I totally debated doing that last year! hi im working on the hat right now but im worried the atlers will lay over what can i do to make sure that doesnt happen? mine kept falling back a bit too, to help knit tightly and fill as you go, don’t overfill or under fill, either will cause problems, you want it snug, but not stretched out. But mine did flop around a bit, I just kept pushing them forward. sorry i don’t have a better answer for you! Problem for me if I follow exactly for antler, I end up wi two exactly the same…… Not facing each other! how do you make one left and one rt one. ?. decide on the two squares where they are going to be, start one from the front and one from the back and you’ll end up with opposite antlers. Does that help? if it doesn’t let me know. Okay, so I got overly ambitious tackling this project, and since I’ve never used dpns before I decided to use a circular and do magic loop instead. Except now that I’m at Row 15 in the antlers, I’m stuck. Is there any way to continue without running out to get dpns? Thanks. I never used a circular needle on something so small, just huge cowls. I would have NO idea how to do this any other way that double pointed, I am so sorry! Siobhan – I’m curious if you were able to finish the antlers with the magic loop method? I despise dpns, so was wanting to try this project with magic loop instead. Man it’s been awhile since I made this, trying to describe how to start the anters was the toughest part of writing this pattern. Hold the beanie with the crown towards you and the bottom (opening) away from you (for both antlers, then k around (12 stitches) starting on the right side, then the bottom (hat opening), then the left side, and finally the top (crown). Does that help? And when you say the u shaped ridges on the outside not the inside? I have NO idea what you mean, but if it’s where your adding your needles it doesn’t matter as much, as long as your happy with the placement, does that answer your question? Row ten says you should knit 9, knit front and back, knit 1, knit front to back and end with 14 stitches. However, I’m left with 18 stitches..
ah got it figured out, great! 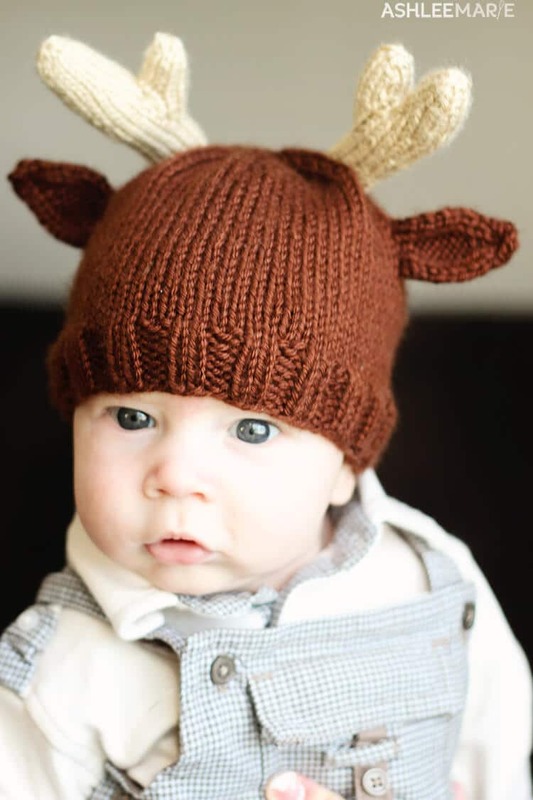 Have you considered creating a crochet pattern for the antlers. I could then add it to other hats I have made with ears. I haven’t. I just love the way knit looks, and the crochet doesn’t stuff as well IMO, the stitches are too thick and they have so much spacing. But I do have a crochet SANTA hat with beard! any one have a pattern for this hat in crochet? So cute! And the hat’s cute as well! I may have to work one up for my “hope chest” – hoping for great-grandchildren! All of my kids and grandkids are “too old” to wear something like this! awww never too old, I’d totally wear this.. if I had the patience to knit an adult beanie! Please make this in adult sizes also….for those “kids” in the Florida retirement community! 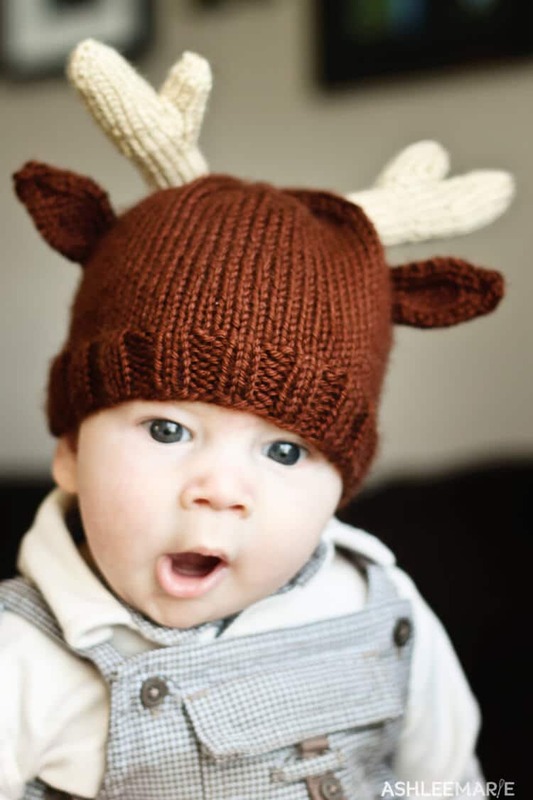 you can just add the same antlers and ears to any size knit beanie.